bulky and awkward items on the roof of your trailer! 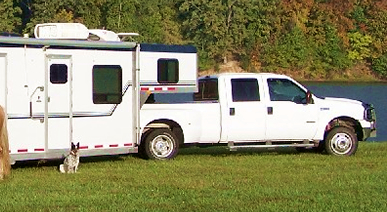 Do you need more space to travel with your horses? The least expensive way to get more space is to GO UP! Today's modern livestock and race car trailers are built with very strong walls, but the roofs are not built to take more than normal snow loads and light weight people occasionally moving about on them. Our system transfers the weight of the load to the side walls - providing a sturdy storage area for your extra cargo. What makes the HayRak storage system unique is it's universal mounting system. 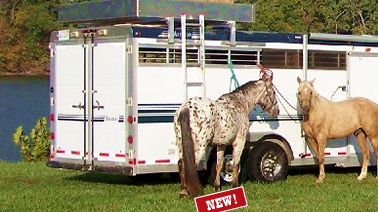 The mounting system is designed to fit any width trailer from 6 feet to 98" (8'2"). Built strong and durable, it is specially designed with high tech, high temper super aluminum alloys. This innovative process provides outstanding strength to the HayRak system. It even comes complete with a ladder. Order today and we ship tomorrow!